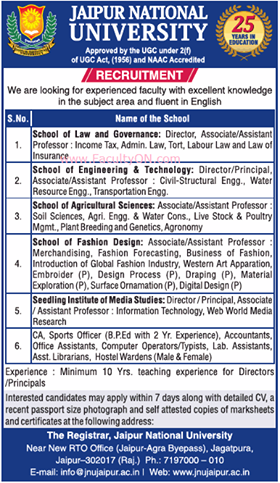 Jaipur National University, Jaipur has advertised in THE TIMES OF INDIA newspaper for the recruitment of Associate Professor/Assistant Professor jobs vacancies. Interested and eligible job aspirants are requested to apply with in 7 days. Check out further more details below. About College: Jaipur National University, Jaipur came into existence in the year 2007. Two professional institutes of the Seedling Group, established in 2002, with several technical & professional programmes of studies, were merged with the University to form its major part.